When you are out exploring and pillaging in untamed lands, you never know when you might need a knife. Prepare yourself for any situation with the Alric LARP Adventurer Dagger, the perfect secondary weapon for any Viking character. This LARP weapon is made from foam with a strong fiberglass core, ensuring that it is durable and flexible while still remaining safe for use in LARPing, theater, staged events, and more. Its straight blade displays a classic Viking design, with two fullers on each side. 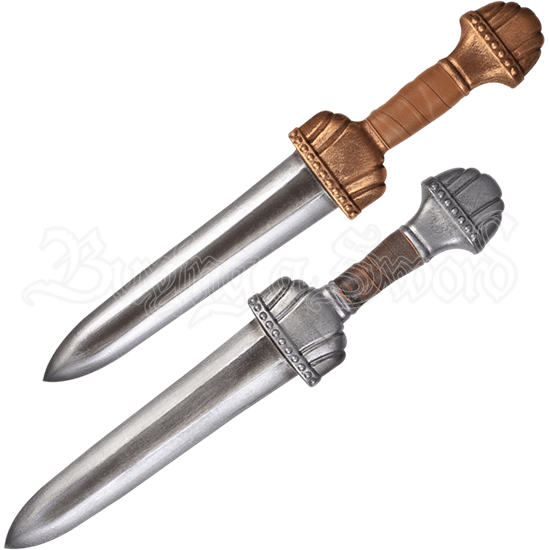 Is hilt, which comes in either steel or gold colors, features a short crossguard and a traditional lobed pommel, and the handle itself is wrapped in leather for easy gripping. The Alric LARP Adventurer Dagger is a must-have for all Norse warriors looking to equip themselves with a handy sidearm. This LARP weapon benefits from periodic silicone treatments. As such, we recommend the use of our Maintenance Silicone for LARP weapons.